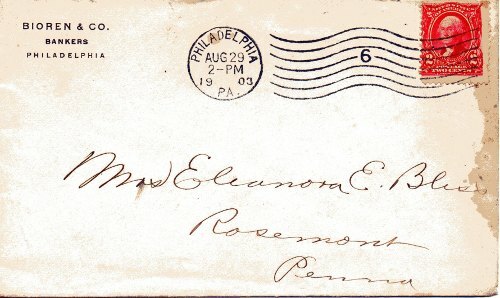 This cover from August 29th, 1903 addressed to Mrs Eleanora E Biss of Rosemont, PA from her bankers, Bioren & Co. of Philadelphia, tells an interesting story. Mrs Eleanora E Bliss (nee Anderson), or “Nellie” to her family, was the wife of Tasker Howard Bliss, whom she married on May 24th 1882. The Anderson and the Bliss families first came together in 1849 when Eleanora's father the Rev. Dr. George W Anderson became professor of Latin at the University of Lewisburg (now Bucknell) where Tasker's father the Rev. Dr. George Ripley Bliss worked as the professor for Greek from 1849 to 1874. After a long courtship, Tasker and Eleanor were married in a ceremony that nearly didn't happen. Eleanor was stricken with partial deafness around 1881 and tried to break off the engagement to Tasker, she didn't want to be a hindrance to Tasker's military career that was just starting to blossom. Tasker wouldn't hear of it. He said that he hadn't fallen in love with her ears and the fact that she couldn't hear very well made no difference to him. Tasker Howard Bliss (Dec. 31 1853 – Nov. 9 1930) was the seventh in a family of thirteen. He attended Lewisburg for one year prior to his admission to West Point from where he graduated in 1876. He was initially assigned to the artillery, but then was called back to West Point to teach French and artillery basics. The main reason for him to discontinue his education at Lewisburg and enter West Point was that of family finances. His father earned $500 per year as a Greek professor, which just didn't go far enough with a family of 15. After the Custer massacre, Tasker appealed to Major John Schofield for active service in the West, but Schofield made him remain until he had finished his four years tour as an instructor. Following a period of routine service after the end of his tour as an instructor at West Point, Tasker was chosen as the army officer to teach military science at the new Naval War College at Newport (1885-88), where he made so distinctive an impression that he was sent on a mission to get information about military schools in England, France and Germany. When Gen. Schofield succeeded Gen. Sheridan as commanding general of the army, he chose Tasker as his aide. Tasker had a number of important postings overseas in Spain, Cuba and Puerto Rico, advancing in rank along the way. President William McKinley recommended that he be made a brigadier-general and the Senate confirmed the promotion without an opposing voice. In 1902, when the Cuban government took over their own administration, Tasker was brought back to Washington as an adviser in reorganizing the army under a general staff system. This is where he would have been working when the letter was send to Mrs Eleanora E Bliss at Rosemont, PA from her bankers. Tasker went on to be appointed to the General Staff as Assistant Chief of Staff for the Army on February 13, 1915 until his promotion to Chief of Staff on September 22 1917. After retiring in November 1917, President Woodrow Wilson recalled him to duty in 1918 and sent him to Versailles, France to participate in negotiating the end of the First World War. Eleanora's father was also a professor at Lewisburg, but the family had more money and connections than Tasker's. Eleanora's mother, Maria (or Ria) was from the Hill family. Her great grandmother was Anne Marie, the daughter of Sir Harry Goring, 6th Baronet, who had quite an interesting life of travel and study throughout Europe and this unconventional approach to educating the daughters of the house was passed down through the generations. Maria had tutors to make her proficient in all branches from dancing, embroidering and music to languages and the sciences. She spoke French just as fluently as English. Eleanora's father didn't have enough money for tutors for her, but her mother made sure that she received the education in everything she needed except dancing, which would have been inappropriate at the time for a minister's daughter. She was fluent in both French and German and spent considerable time living abroad. There are a couple of interesting things about the cover addressed to Mrs Eleanora E Bliss. The first is that Bioren & Co, Bankers wrote to her directly. At that time her husband Tasker would normally have delt with all the financial matters. This could indicate one of two things. Either she still had family money in her own name or Tasker just didn't handle those aspects of life, perhaps because of the demands of his military life. The other interesting thing is that the letter was sent to her family home in Rosemont, PA rather than the home that she and Taster had in Fort Totten, New York, so she must have spent time there while Taster was on active duty.